Solenoid valves and manifolds feature low power consumption, high flow rates, quick response times and clean aesthetic designs. 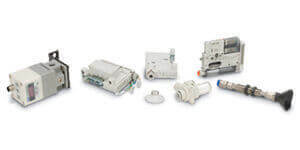 Solenoid valves are used extensively in the semi conductor, automotive, packaging, medical, specialty machine, and machine tool industries. 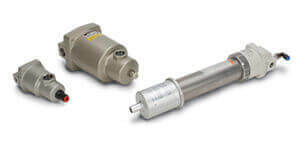 Whatever your application is, we have a dependable solenoid valve series that will accommodate your most demanding application. 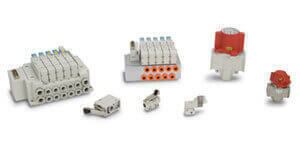 The SJ series is a compact and low profile cassette based 4 port solenoid valve and manifold. 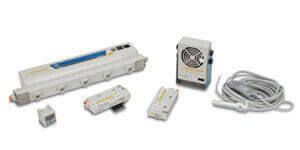 SJ2000 measures 7.5mm wide, while the SJ3000 is 10mm wide and they can be combined to one manifold. The Vacuum Release Valve with Restrictor is also available. The SYJ Valve is an innovative combination of space efficiency and performance superiority which provides real value to the design solution. Whether designed in a manifold or used as a single valve, this small profile increases design flexibility and minimizes space requirements. The SYJ valve utilizes a low power (0.5 watts standard) pilot solenoid design, which dramatically reduces thermal heat generation. This improves performance, decreases operating costs, and allows for direct control by PLC output relays. 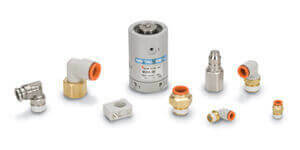 All electrical connections for SYJ Valves are available with lights and surge suppression. 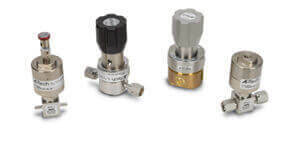 SYJ series valves can be configured on base mounted manifolds, or individually on sub-plates, creating a variety of solutions to meet your broadest engineering needs. 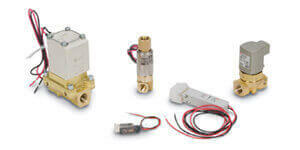 Series SZ3000 is a 5 port solenoid valve, body ported type with a cassette style manifold. 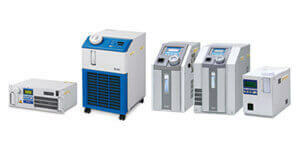 The SZ series offers high reliability and long life of 50 million cycles or more. The connector entry direction can be changed from top to side with a simple operation. 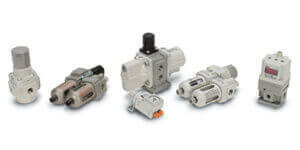 Low power consumption and a fast response time of 10ms are obtained with a unique pilot valve construction. 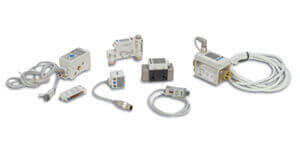 S0700 series is a 5 port solenoid valve that offers a compact design (7.4mm width) with high flow capacity. 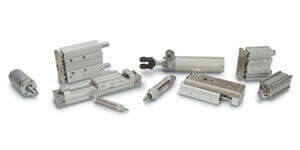 It is suited to drive cylinders up to 32 diameter or as pilot for other valves. S0700 is available as Base mounted or Body ported. 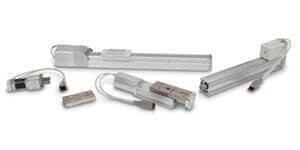 Available interface include fieldbus, terminal block, lead wire, and circular connectors.